Smart shield Turbine Cover have a wide variety of Industrial and commercial applications, such as energy conservation, personnel protection, noise control and freeze protection. Every Turbine Casing Insulation Pads is a custom designed. They can be used to insulate turbine and just about anything you can imagine. Smart shield Turbine Casing Insulation Pads are constructed of only the finest materials. Heavy density needled fibreglass/ceramic is used as the insulating material for most covers, but other materials can be used to meet your specification. elastopolymer coated fiberglass cloth is typically used for the outer weather barrier; but because smart shield Turbine Casing Insulation Pads are each custom designed, they can be made to whatever your specifications require. For applications where temperatures exceed 1200 Celsius, Fiberglass cloth or 304 stainless steel mesh can be used as the inner liner. If oily conditions are a concern, smart shield Turbine Casing Insulation Pads can wrap the insulation in an aluminum jacket before attaching the inner liner or outer finish to keep the insulating from soaking up the oil. These Turbine Casing Insulation Pads have many built in features to assure a good fit and easy installation. 2" wide Hook & Loop Closure strips are applied at the laps, not 1" wide, to make sure the lap stays in place. Polypropylene belts with "D" rings are used to quickly close and secure the covers. Flaps with drawstrings are used to help seal out the weather where the covers mate up to conventional insulation. Binding is used to reinforce all exposed seams. Smart shield Turbine Casing Insulation Pads are sewn to provide strength and a pleasant appearance. At high stress points double and triple stitching is used for reinforcement. For high temperature applications, "hog ring" staples are used. Smart Shield manufactures a complete line of reusable insulation header Covers to meet most industrial, commercial, and laboratory insulating requirements. Our covers are the cost effective providing the user with the energy savings associated with permanent insulation and the flexibility of reusing the cover. Our Covers can be fabricated from a wide range of materials depending upon the system temperature and specific service environment. These covers are made from various grades of industrial woven fiberglass fabric, encapsulating high temperature insulation. Polymer impregnated fiberglass cloth jacketing provides excellent oil, moisture and abrasion resistance, while PTFE coated fiberglass is recommended for corrosive environments. 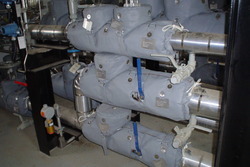 Fiberglass cloths laminated with metal foil are also available for applications requiring a vapor or hydrocarbon barrier. 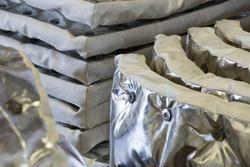 Our Covers can be used in applications ranging from cryogenic temperatures to 1200 degrees Celsius. Smart shield Removable turbine insulation Covers have a wide variety of Industrial and commercial applications, such as energy conservation, personnel protection, noise control and freeze protection. Every smart shield Removable Cover is a custom designed flexible blanket. They can be used to insulate steam turbines and just about anything you can imagine. Smart shield Removable turbine insulation Covers are constructed of only the finest materials. Heavy density needled fiberglass is used as the insulating material for most covers, but other materials can be used to meet your specification. polymer coated fiberglass cloth is typically used for the inner liner and outer weather barrier; but because smart shield Removable Covers are each custom designed, they can be made to whatever your specifications require. For applications where temperatures exceed 1200 celsius, Fiberglass cloth or 304 stainless steel mesh can be used as the inner liner. If oily conditions are a concern, smart shield Removable Covers can wrap the insulation in an aluminum jacket before attaching the inner liner or outer finish to keep the insulating from soaking up the oil. These Removable Covers have many built in features to assure a good fit and easy installation. 2" wide Hook & Loop Closure strips are applied at the laps, not 1" wide, to make sure the lap stays in place. Polypropylene belts with "D" rings are used to quickly close and secure the covers. Flaps with drawstrings are used to help seal out the weather where the covers mate up to conventional insulation. Binding is used to reinforce all exposed seams. 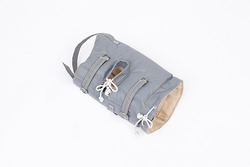 Smart shield Removable Covers are sewn to provide strength and a pleasant appearance. At high stress points double and triple stitching is used for reinforcement. For high temperature applications, "hog ring" staples are used. Smart shield Energy Saving Insulation Jacket have a wide variety of Industrial and commercial applications, such as energy conservation, personnel protection, and heat protection. Every Smart shield Energy Saving Insulation Jacket is a custom designed flexible blanket. They can be used to insulate steam turbines and just about anything you can imagine. Smart shield Energy Saving Insulation Jacket are constructed of only the finest materials. Heavy density needled fiberglass is used as the insulating material for most covers, but other materials can be used to meet your specification. polymer coated fiberglass cloth is typically used for the inner liner and outer weather barrier; but because smart shield insulation jackets are each custom designed, they can be made to whatever your specifications require. For applications where temperatures exceed 1200 celsius, Fiberglass cloth or 304 stainless steel mesh can be used as the inner liner. If oily conditions are a concern, smart shield insulation jacket can wrap the insulation in an aluminum jacket before attaching the inner liner or outer finish to keep the insulating from soaking up the oil. These insulation jacket have many built in features to assure a good fit and easy installation. 2" wide Hook & Loop Closure strips are applied at the laps, not 1" wide, to make sure the lap stays in place. Polypropylene belts with "D" rings are used to quickly close and secure the covers. Flaps with drawstrings are used to help seal out the weather where the covers mate up to conventional insulation. Binding is used to reinforce all exposed seams. Smart shield insulation jacket are sewn to provide strength and a pleasant appearance. At high stress points double and triple stitching is used for reinforcement. For high temperature applications, "hog ring" staples are used. Smart shield main fold Energy Saving Jacket have a wide variety of Industrial and commercial applications, such as energy conservation, personnel protection, and heat protection. Every Smart shield main fold Energy Saving Jacket is a custom designed flexible blanket. They can be used to insulate main fold and just about anything you can imagine. Smart shield main fold Energy Saving Jacket are constructed of only the finest materials. Heavy density needled fiberglass is used as the insulating material for most covers, but other materials can be used to meet your specification. polymer coated fiberglass cloth is typically used for the inner liner and outer weather barrier; but because Smart shield main fold Energy Saving Jacket are each custom designed, they can be made to whatever your specifications require. These main fold Energy Saving Jacket have many built in features to assure a good fit and easy installation. 2" wide Hook & Loop Closure strips are applied at the laps, not 1" wide, to make sure the lap stays in place. Polypropylene belts with "D" rings are used to quickly close and secure the covers. Flaps with drawstrings are used to help seal out the weather where the covers mate up to conventional insulation. Binding is used to reinforce all exposed seams. Smart shield main fold Energy Saving Jacket are sewn to provide strength and a pleasant appearance. At high stress points double and triple stitching is used for reinforcement. For high temperature applications, "hog ring" staples are used. SMART SHIELD engineers valve insulation covers to fit any type or model of valve manufactured today. Also called valve insulation blankets, our time-saving, removable valve insulation covers are custom-designed to guarantee a tight fit, durability and a high-quality appearance. 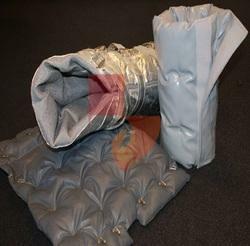 SMART SHIELD engineers valve insulation blanket to fit any type or model of valve manufactured today. Also called valve insulation cover, our time-saving, removable valve insulation covers are custom-designed to guarantee a tight fit, durability and a high-quality appearance. 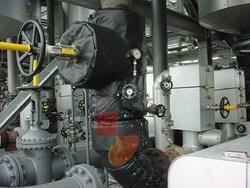 Smart shield thermal and acoustic insulation for gas/steam turbines and conveyors. This thermo-insulating and thermo-sound insulating mats suitably modelled for optimal coverage; smart shield provides a turnkey product for direct use on-site, with clear assembly instructions. The company's textile department is capable of creating complex forms for the most diverse surfaces; the use of specific technical materials combined in multi-layers allows for reducing heat by up to 1200°C, for maintaining the process temperature and/or for personal protection. Smart shield removable insulation covers have a wide variety of Industrial and commercial applications, such as energy conservation, personnel protection, and heat protection. Every Smart shield removable insulation covers is a custom designed flexible blanket. They can be used to insulate main fold and just about anything you can imagine. Smart shield removable insulation covers are constructed of only the finest materials. Heavy density needled fiberglass is used as the insulating material for most covers, but other materials can be used to meet your specification. polymer coated fiberglass cloth is typically used for the inner liner and outer weather barrier; but because Smart shield removable insulation covers are each custom designed, they can be made to whatever your specifications require. For applications where temperatures exceed 1200 celsius, Fiberglass cloth or 304 stainless steel mesh can be used as the inner liner. If oily conditions are a concern, Smart shield removable insulation covers can insulate in an aluminum jacket before attaching the inner liner or outer finish to keep the insulating from soaking up the oil. 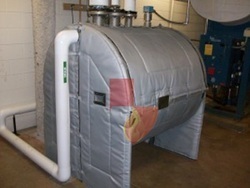 These removable insulation covers have many built in features to assure a good fit and easy installation. 2" wide Hook & Loop Closure strips are applied at the laps, not 1" wide, to make sure the lap stays in place. 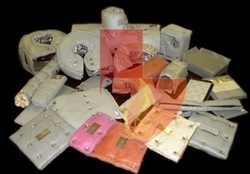 Polypropylene belts with "D" rings are used to quickly close and secure the covers. Flaps with drawstrings are used to help seal out the weather where the covers mate up to conventional insulation. Binding is used to reinforce all exposed seams. 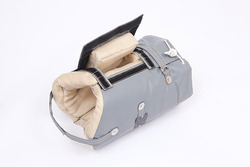 Smart shield removable insulation covers are sewn to provide strength and a pleasant appearance. At high stress points double and triple stitching is used for reinforcement. For high temperature applications, "hog ring" staples are used. Smart shield thermal insulation covers have a wide variety of Industrial and commercial applications, such as energy conservation, personnel protection, and heat protection. Every Smart shield thermal insulation covers is a custom designed flexible cover. They can be used to insulate main fold and just about anything you can imagine. Smart shield thermal insulation covers are constructed of only the finest materials. Heavy density needled fiberglass is used as the insulating material for most covers, but other materials can be used to meet your specification. polymer coated fiberglass cloth is typically used for the inner liner and outer weather barrier; but because Smart shield removable insulation covers are each custom designed, they can be made to whatever your specifications require. For applications where temperatures exceed 1200 celsius, Fiberglass cloth or 304 stainless steel mesh can be used as the inner liner. If oily conditions are a concern, Smart shield thermal insulation covers can insulate in an aluminum jacket before attaching the inner liner or outer finish to keep the insulating from soaking up the oil. These thermal insulation covers have many built in features to assure a good fit and easy installation. 2" wide Hook & Loop Closure strips are applied at the laps, not 1" wide, to make sure the lap stays in place. Polypropylene belts with "D" rings are used to quickly close and secure the covers. Flaps with drawstrings are used to help seal out the weather where the covers mate up to conventional insulation. Binding is used to reinforce all exposed seams. Smart shield thermal insulation covers are sewn to provide strength and a pleasant appearance. At high stress points double and triple stitching is used for reinforcement. For high temperature applications, "hog ring" staples are used. Smart shield furnace insulation have a wide variety of Industrial and commercial applications, such as energy conservation, personnel protection, noise control and freeze protection. Every furnace insulation is a custom designed. They can be used to insulate furnace and just about anything you can imagine. Smart shield furnace insulation are constructed of only the finest materials. Heavy density needled fibreglass/ceramic is used as the insulating material for most covers, but other materials can be used to meet your specification. polymer coated fiberglass cloth is typically used for the outer weather barrier; but because smart shield furnace insulation are each custom designed, they can be made to whatever your specifications require. For applications where temperatures exceed 1200 celsius, Fiberglass cloth or 304 stainless steel mesh can be used as the inner liner. If oily conditions are a concern, smart shield furnace insulation can wrap the insulation in an aluminum jacket before attaching the inner liner or outer finish to keep the insulating from soaking up the oil. These furnace insulation have many built in features to assure a good fit and easy installation. 2" wide Hook & Loop Closure strips are applied at the laps, not 1" wide, to make sure the lap stays in place. Polypropylene belts with "D" rings are used to quickly close and secure the covers. Flaps with drawstrings are used to help seal out the weather where the covers mate up to conventional insulation. Binding is used to reinforce all exposed seams. Smart shield furnace insulation are sewn to provide strength and a pleasant appearance. At high stress points double and triple stitching is used for reinforcement. For high temperature applications, "hog ring" staples are used. Smart shield insulation blanket have a wide variety of Industrial and commercial applications, such as energy conservation, personnel protection, noise control and freeze protection. Every insulation blanket is a custom designed. They can be used to insulate about anything you can imagine. Smart shield insulation blanket are constructed of only the finest materials. Heavy density needled fibreglass/ceramic is used as the insulating material for most blanket, but other materials can be used to meet your specification. polymer coated fiberglass cloth is typically used for the outer weather barrier; but because smart shield insulation blanket are each custom designed, they can be made to whatever your specifications require. For applications where temperatures exceed 1200 celsius, Fiberglass cloth or 304 stainless steel mesh can be used as the inner liner. If oily conditions are a concern, smart shield insulation blanket can wrap the insulation in an aluminum jacket before attaching the inner liner or outer finish to keep the insulating from soaking up the oil. 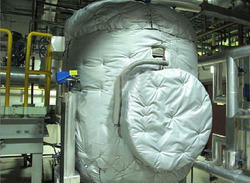 These insulation blanket have many built in features to assure a good fit and easy installation. 2" wide Hook & Loop Closure strips are applied at the laps, not 1" wide, to make sure the lap stays in place. Polypropylene belts with "D" rings are used to quickly close and secure the covers. Flaps with drawstrings are used to help seal out the weather where the covers mate up to conventional insulation. Binding is used to reinforce all exposed seams. Smart shield insulation blanket are sewn to provide strength and a pleasant appearance. At high stress points double and triple stitching is used for reinforcement. For high temperature applications, "hog ring" staples are used. Smart shield Blast Furnace Insulation Covers have a wide variety of industrial and commercial applications, such as energy conservation, personnel protection, noise control and freeze protection. 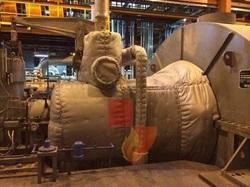 Every smart shield blast furnace insulation is a custom designed flexible blanket. They can be used to insulate steam turbines and just about anything you can imagine. Smart shield blast furnace insulation are constructed of only the finest materials. Heavy density needled fiberglass is used as the insulating material for most covers, but other materials can be used to meet your specification. 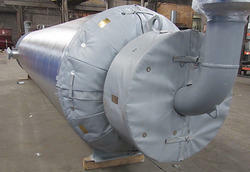 Polymer coated fiberglass cloth is typically used for the inner liner and outer weather barrier; but because blast furnace insulation are each custom designed, they can be made to whatever your specifications require. These blast furnace insulation have many built in features to assure a good fit and easy installation. 2" wide Hook & Loop Closure strips are applied at the laps, not 1" wide, to make sure the lap stays in place. Polypropylene belts with "d" rings are used to quickly close and secure the covers. Flaps with drawstrings are used to help seal out the weather where the covers mate up to conventional insulation. Binding is used to reinforce all exposed seams. 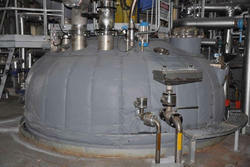 Smart shield blast furnace insulation are sewn to provide strength and a pleasant appearance. At high stress points double and triple stitching is used for reinforcement. For high temperature applications, "hog ring" staples are used. Smart Shield Turbine Jacket have a wide variety of Industrial and commercial applications, such as energy conservation, personnel protection, noise control and freeze protection. Every Smart Shield Turbine Jacket is a custom designed flexible blanket. They can be used to insulate steam turbines and just about anything you can imagine. Smart Shield Turbine Jacket are constructed of only the finest materials. Heavy density needled fiberglass is used as the insulating material for most covers, but other materials can be used to meet your specification. polymer coated fiberglass cloth is typically used for the inner liner and outer weather barrier; but because Turbine Jacket are each custom designed, they can be made to whatever your specifications require. These Turbine Jacket have many built in features to assure a good fit and easy installation. 2" wide Hook & Loop Closure strips are applied at the laps, not 1" wide, to make sure the lap stays in place. Polypropylene belts with "D" rings are used to quickly close and secure the covers. Flaps with drawstrings are used to help seal out the weather where the covers mate up to conventional insulation. Binding is used to reinforce all exposed seams. Smart Shield Turbine Jacket are sewn to provide strength and a pleasant appearance. At high stress points double and triple stitching is used for reinforcement. For high temperature applications, "hog ring" staples are used. Smart Shield Turbine Insulation have a wide variety of Industrial and commercial applications, such as energy conservation, personnel protection, noise control and freeze protection. 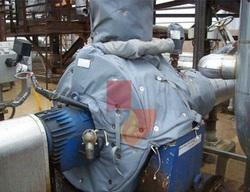 Turbine Insulation is a custom designed flexible blanket. They can be used to insulate steam turbines and just about anything you can imagine. Smart Shield Turbine Insulation are constructed of only the finest materials. Heavy density needled fiberglass is used as the insulating material for most covers, but other materials can be used to meet your specification. polymer coated fiberglass cloth is typically used for the inner liner and outer weather barrier; but because Turbine Insulation are each custom designed, they can be made to whatever your specifications require. These Turbine Insulation have many built in features to assure a good fit and easy installation. 2" wide Hook & Loop Closure strips are applied at the laps, not 1" wide, to make sure the lap stays in place. Polypropylene belts with "D" rings are used to quickly close and secure the covers. Flaps with drawstrings are used to help seal out the weather where the covers mate up to conventional insulation. Binding is used to reinforce all exposed seams. Turbine Insulation are sewn to provide strength and a pleasant appearance. At high stress points double and triple stitching is used for reinforcement. For high temperature applications, "hog ring" staples are used. Smart Shield Turbine Cover have a wide variety of Industrial and commercial applications, such as energy conservation, personnel protection, noise control and freeze protection. Every Turbine Cover is a custom designed flexible blanket. They can be used to insulate steam turbines and just about anything you can imagine. SMART SHIELD Turbine Cover are constructed of only the finest materials. Heavy density needled fiberglass is used as the insulating material for most covers, but other materials can be used to meet your specification. polymer coated fiberglass cloth is typically used for the inner liner and outer weather barrier; but because Turbine Cover are each custom designed, they can be made to whatever your specifications require. 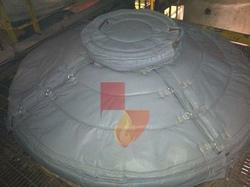 These Turbine Cover have many built in features to assure a good fit and easy installation. 2" wide Hook & Loop Closure strips are applied at the laps, not 1" wide, to make sure the lap stays in place. 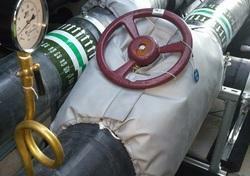 Polypropylene belts with "D" rings are used to quickly close and secure the covers. Flaps with drawstrings are used to help seal out the weather where the covers mate up to conventional insulation. Binding is used to reinforce all exposed seams. 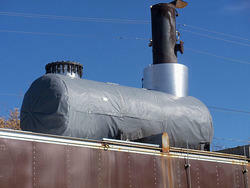 Turbine Cover are sewn to provide strength and a pleasant appearance. At high stress points double and triple stitching is used for reinforcement. For high temperature applications, "hog ring" staples are used. Looking for Customized Protection Covers ?